I am seriously in love with pumpkin. There are so many fun ways to cook with it! These cookies are super easy……you can leave off the fancy dollop of cream cheese frosting and the cute chocolate pumpkin and they are still taste delicious. Cookie Recipe from Weight Watchers, Frosting and Pumkins from Jamie Cooks It Up! cake decorating bag and small tip, or a ziploc bag. 1. To make the cute little chocolate pumpkins, melt the chocolate chips in the microwave. Only let them cook for 30 seconds at a time, stirring between each cooking interval. You don’t want the chocolate to burn! Stir in the Crisco when they are almost melted. 2. You can use a zip lock baggie to pipe the chocolate into pumpkins. Just snip (a very tiny snip) the edge of the bag after you have filled it with the chocolate. 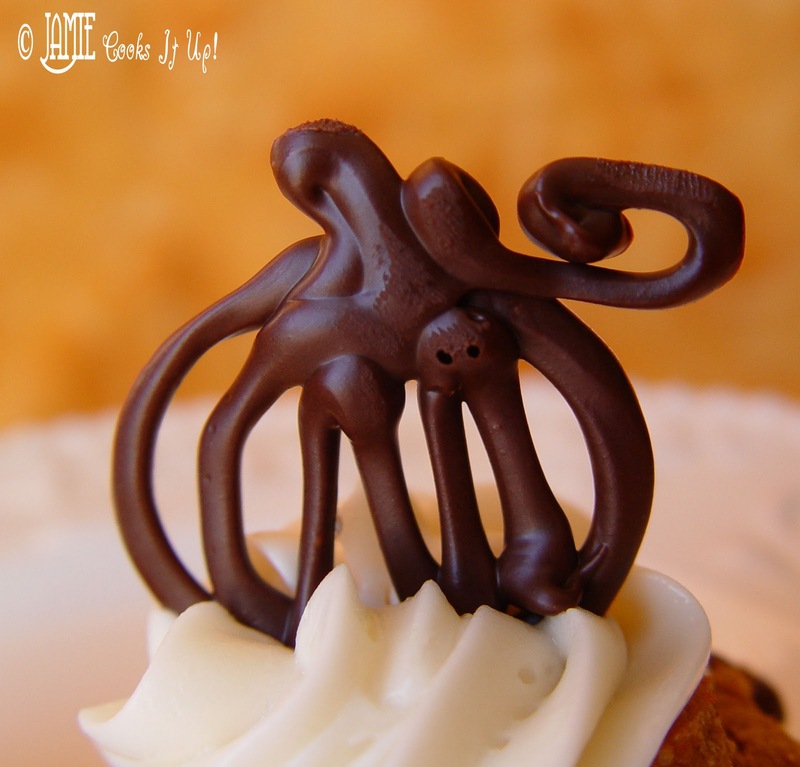 I used a cake decorating bag with a small tip…it gave me a lot more control over where the chocolate was going. 3. Place a sheet of wax paper onto a cookie sheet that will easily slide into you freezer. Draw the pumpkins onto the wax paper. Don’t worry if they are lop sided, or not the same shape or size. That’s the fun of drawing pumpkins, they don’t have to match…they can all be different. 4. Slide the cookie sheet into the freezer so the chocolate will harden back up. The chocolate will harden really quickly, but keep them in there until your cookies have cooled and been frosted. 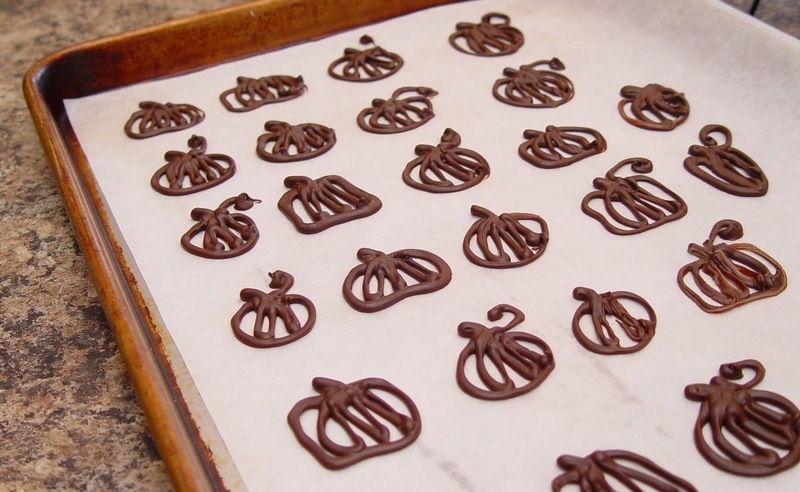 The chocolate melts really fast as well, thus causing your cute pumpkins to loose their shape. 1.In your mixer, or mixing bowl combine the cake mixes and canned pumpkin. Mix until ingredients are incorporated. Add the chocolate chips. 2. Drop cookie dough (about 2 inches each) with a spoon onto a greased cookie sheet. 3. Bake for 12 minutes at 350 degrees. 4. Let the cookies cool on a wire rack. 1. Beat the cream cheese with hand held beaters, or in your Kitchen Aid mixer, until smooth. Add the butter and beat for about 1 minute. 2. Add the powdered sugar and beat for 3 minutes. You want it to be silky smooth. 3. After the cookies have cooled completely, pipe the frosting into the center of each cookie and gently place a chocolate pumpkin on top. Jamie, thank you so much for your sweet comment on my blog! I love chocolate transfers and HOLY COW are these pumpkins cute!! You did such a great job! We love pumpkin cookies around here, I'll have to try a choc pumpkin on top, my girls would love me forever. 🙂 Thanks for the great ideas, can't wait to see more, I'll be back often! All I can say is yummy! Oh yeah, and I'm trying this recipe this week!! Oh, and also, you're amazing and I'm bookmarking this food blog right now and can't wait to try all your other recipes you have posted. They all look delicious!! Jamie, you're amazing! 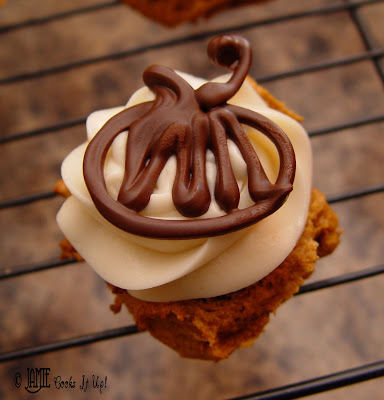 Those pumpkin cookies minus the frosting and cute pumpkin are a Weight Watcher's recipe!! They are my fav!! I haven't tried them with spice though only carrot cake!! i will have to try spice!! Jamie, I don't know how you have time for all you do, but glad you do!! I love, LOVE pumpkin too. I will be making these ASAP!! This looks like it's going to be a really fun site! Can't wait to try some recipes! I just made these: super easy, and extremely delicious. Another hit, Jamie. I couldn't draw on the waxed paper, it wouldn't show up. So I drew them on regular paper which I placed on a cookie sheet and then put waxed paper over the top. Worked great. I've been a follower (stalker) for some time now. Thank you so much for sharing all your wonderful recipes and ideas! I'm a beginner at cooking and am so grateful for all of your easy, quick and delicious recipes. I've tried many of them and my husband loves them all! Thanks for sharing so many wonderful recipes! LOVE your blog! Soooo cute! I think I am going to make these this afternoon, but skip the pumpkins, tint the icing orange, and let my kiddos make faces with chocolate chips! Thanks! So, when making these, don you just use the cake mix as is, or do you do the cake mix instructions and add pumpkin to that? I have the same question as Bess. I am dying to make these and am wondering if I follow the cake mix instructions or just use the mix with the pumpkin and nothing else?